PSICAN - Paranormal Studies and Inquiry Canada - Mama, I am not a bad cat! Mama, I am not a bad cat! Canadian historian Chris Laursen recalls the tale of Whitey, a cat from the Florida suburbs who seemed to have the uncanny ability to talk. Ruth Deem was lying on her bed when her six-month-old cat Whitey jumped up. “Mama, I’m hungry,” the white cat told her. Mrs. Deem was quite surprised, and replied, “What did you say?” “I’m hungry,” Whitey repeated in his high cat voice. A talking cat? She and her husband had rescued the male kitten, found abandoned and hungry near their home in Hillside Acres, Florida in June 1963. Little could they have imagined that they had inherited a cat who would speak English and become a Fortean legend. Mrs. Deem didn’t think it was appropriate to mention Whitey’s strange talent to her husband, but a few days after Whitey’s first words, Mr. Deem was petting Whitey and jokingly called him a bad cat. “I am not a bad cat. I want out,” Whitey replied tersely. Mr. Deem called to his wife, “Did you hear that?” giving her a sense of relief that she was not alone in hearing their white cat talk. At the time, the Deems had one other cat (though by 1967, when Search Magazine wrote about Whitey the Talking Cat, they had 19 felines running around the house). The other cat’s name was Blackie, and he was obviously Whitey’s archenemy. Whitey used his ability to talk to berate how bad Blackie treated him. “He’s bad” or “He’s mean,” Whitey would often tell Mrs. Deem. His comments came almost daily in a “whining, self-pitying manner as though still aggrieved by its wretched infancy,” Bob Rickard and John Mitchell wrote in their compendium Unexplained Phenomena. Mrs. Deem added, however, that although Whitey spoke quietly, his words were usually quite clear and distinct. Whitey enjoyed watching television with the Deems. Once, Search Magazine reported, there was a picture of a dog on TV, and Whitey, almost as if he were reassuring himself, commented, “He is not real.” Another time, a man was shot on a television show, and Whitey asked Mrs. Deem, “Was he hurt?” Mrs. Deem replied that he wasn’t, but Whitey wasn’t convinced of her answer. “Don’t tell a lie, Mama,” he said. “Talking apart,” Rickard and Mitchell wrote, “he was a normal tom cat who liked to go out on prowls.” When the famed psychic, writer and paranormal investigator Susy Smith came to investigate, Whitey had been poisoned while out and about, which apparently inhibited his speech. But neighbours corroborated the Deem’s claim. One such neighbour, Marshall Furgeson, had looked after Whitey and Blackie when the Deems were away. One day, the two cats got into a scrap and he swatted them with a newspaper to break it up. Upon Mrs. Deem’s return home, Whitey accusingly told her in front of the neighbour, “He hit me!” “Who hit you?” asked Mrs. Deem, and Whitey replied “Him,” referring to the present Mr. Furgeson. “What did he hit you with?” Mrs. Deem asked. “Newspaper,” Whitey replied. Up until that point, Mr. Furgeson had been very sceptical that Whitey could actually talk as was claimed. Perhaps one of the most self-pitying comments of all were, “Why no one love me?” Whitey always seemed to feel that he wasn’t getting enough attention, and that people were mistreating him. He even caught the attention of a policeman passing by the Deem’s car one day. They were having a nap during a road trip through North Carolina which included Whitey. According to Search Magazine’s report, the policeman heard a cry, “Help! Help!” When he approached the car, he found the cat inside with its sleepy owners saying, “I want out! Nobody love me!” You have to wonder if the officer bothered writing a report on that incident. A professor of sociology at Florida Southern College, Dr. Hornell Hart, offered various theories after discussing the case with Susy Smith. His three possible explanations, according to Rickard and Michell: ventriloquism, the misinterpretation of a cat’s meows, and “the development of a fad under which it becomes stylish for individuals to report having heard a cat make various remarks.” Note that the simple fact that the cat could actually talk is not mentioned. Susy Smith, however, thought witness evidence was substantial to demonstrate that Whitey, somehow, could talk. There is another paranormal possibility that Matthew Didier and Sue St Clair mentioned to me when we were doing an investigation last Sunday, and Rickard and Michell also touched on this in their book. They mentioned the famous case of Gef the Talking Mongoose, investigated by paranormal sleuth Harry Price and Richard S. Lambert in the 1930s. The elusive mongoose lived in a house on the Isle of Man (kept there because the teenaged girl of the house loved him and besides, he kept the rat population down!). Gef could speak in a high, feminine voice, but upon further investigation, it was determined that the disembodied voice attributed to the invisible mongoose was a rare incident of poltergeistery. Could Whitey’s speaking abilities have been the product of a poltergeist? But the story of Gef the Talking Mongoose is a completely different Weird Wednesday in itself – for another time! 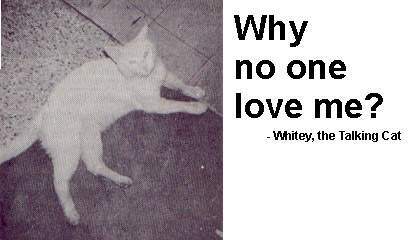 Whatever the case, it is hard to ignore the story of Whitey the talking cat from the Florida suburbs. Whitey wasn’t always self-pitying. He certainly loved Mrs. Deem. 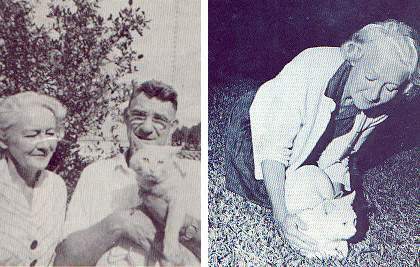 After she had been in the hospital with an illness for an extended period in 1966, upon returning home, Whitey ran right up to her and gripped his paws around her leg, refusing to let go. “Mama home! Mama home!” he joyously said. What would you do if an animal started talking to you? In Search of the Talking Cat by Susy Smith in Fate Magazine, November 1965. Whitey Talks (The Talking Cat) by Bennett Wm. Palmer in Search Magazine, November 1967. Bob Rickard and John Michell. Unexplained Phenomena: A Rough Guide Special. London: Rough Guides, 2000.